Hey there you guys. How are you doing? I hope you are doing good! If you are in town looking for the easiest way to download videos from the Internet. Then this post is for you! Read on! I must warn you to the check copyrights of videos before proceeding to download. 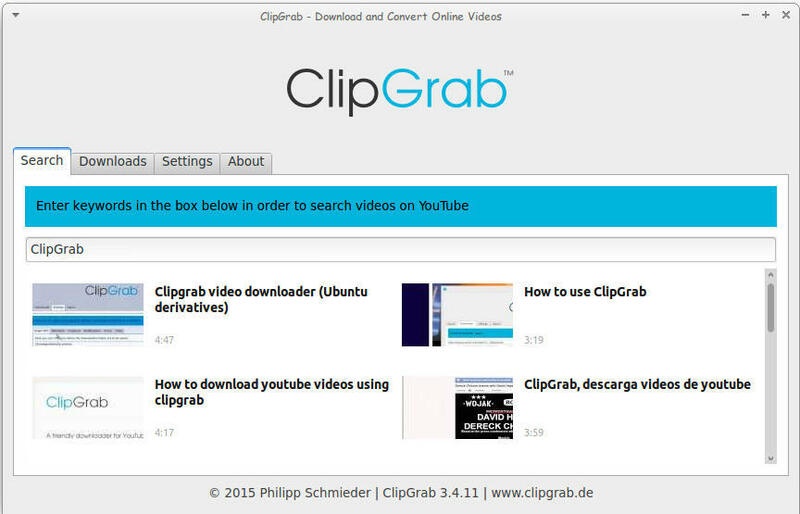 ClipGrab is very useful when downloading videos from sites such as YouTube and Facebook (some of my best friends are still addicted to it!) very easily. Much like YTD which I reviewed here. It supports some sites officially but can download from thousands of sites (According to the site!). All you have to do is to visit the site and download the proper version for your OS. I'm using Ubuntu for this tutorial. Next extract it to a directory of your choosing. And double click for it to run. It's divided into tabs, the first is Search. Which I used to find videos about ClipGrab! The second is Downloads. Paste the video link and choose the quality. I'm using a video from the search results, and wait for it to end! The only drawback it can't download some Facebook videos. But the rest is as smooth as milk! You can also use it to convert videos as long as you download ffmpg package, which also enables you to download videos with 1080 quality. After download you can choose the format. And ClipGrab will download it in that format! I've saw this in YTD Pro! Feel free to donate to support the program! And click here to download for Linux. When upgrading to Ubuntu Gnome 16.04 I was surprised that ClipGrab stopped working, it won't even launch! Luckily the good people at ClipGrab gave me the easy fix. And that was to download and install the dependencies libqtgui4 and libqtwebkit4. After downloading libqtwebkit4 ClipGrab worked without a problem! I hope you liked this post. Let me know what you think in the comments section to below.